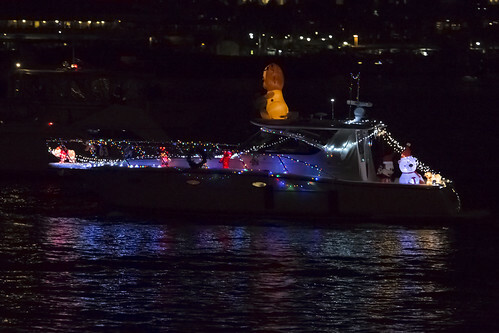 The San Diego Bay Parade of Lights is an annual tradition giving boat owners the opportunity to light up their vessels and show them off for fun and awards. The theme for the 45th annual parade paid homage to the San Diego Zoo's 100th anniversary. A few boaters rigged up a string or three of lights for the fun of it and called it a night. Others took the awards suggestions to heart and cranked up the lumens (easy to do nowadays in this era of efficient LED light strings) and the music. This was the first time I enjoyed this in its entirety after years of never getting around to it (and one year battling traffic and trying to find an elusive parking spot near the crowded starting point, only to miss the parade as the last boat pulled away).